Last year, global commitments like the Sustainable Development Goals (SDGs), Paris Climate Agreement, and Brasilia Declaration on Road Safety gave us a guiding vision for the direction we need to move in. The morning of Day 2 began by looking at leading examples of how change is already happening on the ground and how we can concretely connect the global and the local. Afternoon parallel sessions homed in on equitable transit-oriented development (TOD) and how cities can improve upon data collection. “I cannot accept even one death [on the roads]…every death is one too much,” said H.E. François Bausch, Minister of Sustainable Development and Infrastructure at Luxembourg. H.E. 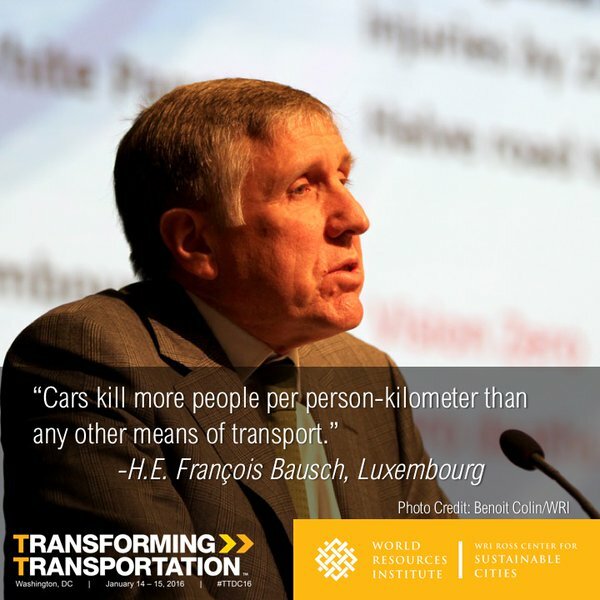 François Bausch kicked off the discussion on road safety by explaining Luxembourg’s “vision zero” policy, highlighting the country’s action plan for road safety (2014 – 2018). The speakers examined ways countries can work to meet the Sustainable Development Goal (SDG) 3.6, which calls for the world to halve the number of global deaths and injuries from road traffic crashes by 2020. Claudia Adriazola-Steil, Health & Road Safety Director of WRI Ross Center for Sustainable Cities, reminded us that we should first focus on the design of our infrastructure to improve safety. Adriazola-Steil argued that cities should be designed in ways that account for human error, calling transport planners to design roads in ways that reduce the risk of crashes in the first place: “It’s easy to blame the victims…but we are the ones responsible for what we are designing,” she said. 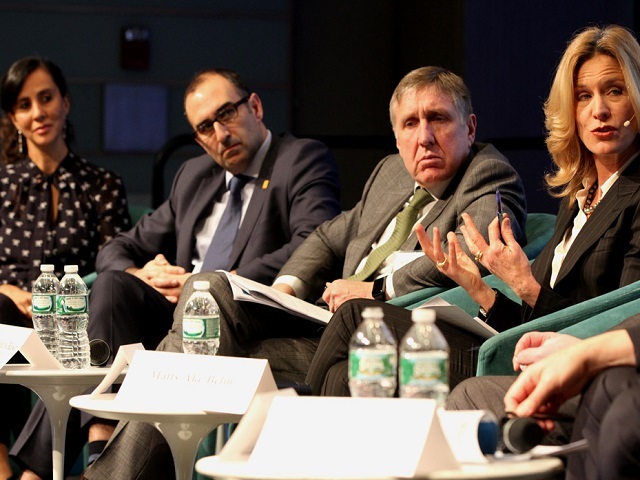 When looking to the future of road safety, panelists were optimistic that technology would play a positive role in decreasing the risk of traffic crashes. “We should come up with ways that technology can effectively improve safety in road transportation,” said Oscar De Buen, CEO of PIARC: World Road Association. Paired with safer urban design, technology–like speeding cameras and inebriation controls–can be extremely effective in addressing the behavioral aspects of road safety. The speakers also urged civil society and policy makers to invest more in road safety, particularly within developing countries that disproportionately suffer from road safety deaths. According to the World Health Organization’s (WHO) 2015 Global status report on road safety, 1.25 million people die every year from traffic crashes, and the majority of those fatalities occur in developing countries. Transit-oriented development (TOD) is a critical component of a compact and connected city. However, it can be difficult to ensure that the planning process is inclusive and that the outcome is equitable for low-income populations. In a Pecha Kucha-style session, participants discussed how different cities are looking to make development work for all people. Brittany Lane, Governance Associate at World Resources Institute, talked about her study of urban governance in Porto Alegre, Sao Paulo and Rio de Janeiro. TOD policy creation in Brazil involves a complex web of decision making between multiple layers of governance, and neighborhood-level participation is often lacking. Much can be planned by urban planners, but the challenge is implementing these ideas. As Rio gears up for the Olympics, many private stakeholders will be involved in the city’s development; the question, however, remains: how can the city be inclusive of the local community? Data experts, city leaders and members of the private sector came together to discuss the role that data collection plays in urban transport, and identified ways it can improve. Beginning the event, Alexander Kubrakov, Advisor to the Mayor in Kiev, explained how technology has dramatically changed the way that data is collected. Rather than simply relying on in-person questionnaires or surveys, the city of Kiev used a mix of online surveys, General Transit Feed Specification (GTFS) data from Google, demographic data, and fare-collection data to improve transport operations in the area. In short, Kiev shows how tech has improved data collection options, making it cheaper, faster and better. However, as Diego Canales, Data Innovation Associate at WRI Ross Center for Sustainable Cities made clear, data collection and technological capacity varies vastly between cities. Canales listed Cairo as an example, a city which used to have all of their bus data in maps until they recently digitized them. Many cities, however, have yet to advance their data collection, and are therefore unable to utilize new technology coming out of businesses, like Google: “When we talk about a new source of data…I think a lot of cities are not equipped to have this conversation with the private sector,” Canales said. Many cities are beginning to fill this gap through the widespread use of mobile phones and smart payment technologies. Young Jun Moon, Research Fellow, KOTI, Korea cited the rise of smartphones in the country, as well as Korea’s T-Money card which allows users to pay transportation fares across the country, as new ways to collect data. These new devices “Reduce tremendous time and cost” for data collection, he said. But what’s holding technology and data back? According to Deevya Desai, Regional Policy and Research Manager at GrabTaxi, security and privacy of transport data is a major concern. Also, too often, data is privatized and difficult to access. The solution lies in responsible oversight, improved infrastructure and capacity, and opening up data.